and MARIA ROSA MYSTICA, Fr. A.M. Weigl. You are referred to the directory of Rosa Mystica for more of the story of the apparitions, which has the approval of the local bishop and was accepted by Ven. Pope Pius XII. Officially the Holy See has not pronounced on the supernatural nature of the apparitions, but has permitted the bishop's approval to stand. On August 9, 1951 Pope Pius XII granted a private audience to Pierina Gilli, the seer of Montichiari at Castel Gandolfo. She had arrived with a freind and the man who had arranged the audience. At the close of the meeting the Pontiff bent toward the kneeling seer and asked her to pray for him and the Pontiffs, saying: "Please, pray also for Us!" 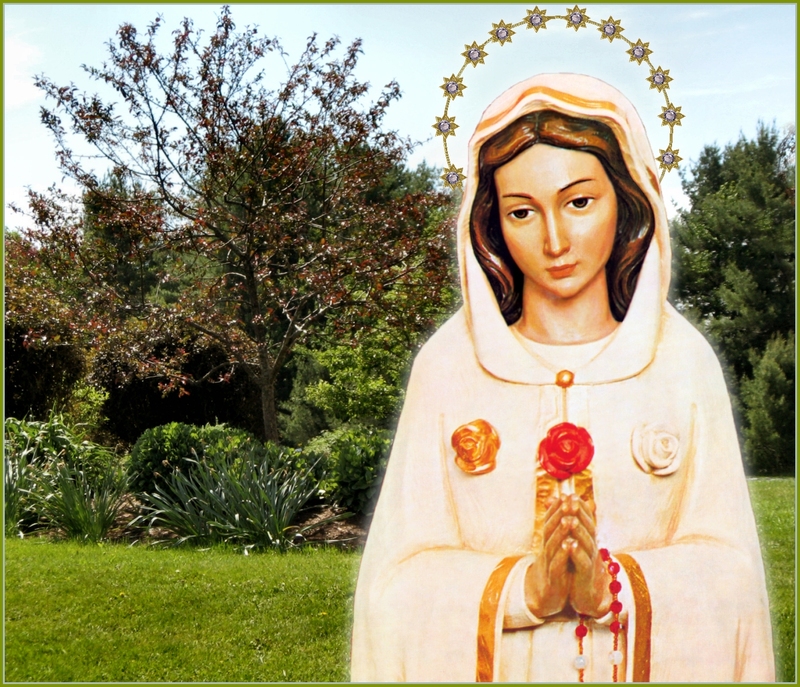 It was in Montichiari, Italy on July 13th, 1941 that Our Lady said: It is my wish that the 13th of July of each year be celebrated in honour of the Rosa Mystica---I am the Mother of the mystical body of Christ---the Mother of the Church". The Blessed Virgin showed Pierina a medal, which was engraved on the front with her image and title, "Rosa Mystica" and on the back was a church with a dome and the inscription "Mary, Mother of the Church". In the church of Maria Rosenberg in Germany, there is a miraculous image that is venerated as "Rosa Mystica". Church documents from 1138 attest to this long standing devotion. Under that image are painted a white, a red, and a golden rose. And around the image on the right and on the left are painted thirteen golden roses. This is unmistakably a future indication of Our Lady's express desire at Montichiari that the 13th of July be venerated in honor of the Rosa Mystica. The writngs of Church Fathers also use this title for the Mother of God. If we look to the origin of the apparitions, we find that Our Lady is most concerned with priests and religious. The 1st sword: loss of priestly and religious vocations. It has happened. The 2nd sword: Priests and members of religious orders living in a state of mortal sin. We know from the scandals here in the USA that surely this was[ perhaps is] the sad case. The 3rd sword: Priests and religious who commit the betrayal of Judas. Much heresy and blasphemy from some pulpits and in some religious institutes; at the very least the scandal of the loss of faith and disobedience from the teachings of Christ through His Church. It is the established theme of Montichiari that Rosa Mystica's primary reason for manifesting herself there was for the sake of priests, religious houses, and all those with dedicated apostolates and who have who have a special place in the Hearts of our Lord and His Mother. And yet, how many of them have thrust these sorrowful swords into Their most holy Hearts! "In about 10 years some 30,000 priests of the Catholic Church have lost their vocations. Only about half of these have asked for ecclesiastical laicization. The other half have not bothered. In practice this means that many thousands of priests and members of religious orders have not only abandoned their vocation, but also lost their faith. They have contracted civil marriages, and many are divorced. In addition to these priests, there are also four or five times as many brothers and sisters in religious orders, who have given up their vocations. In total this makes more than 100,000 priests and religious." But there are enough faithful Catholics left so that,it is to these the mournful mother is turning with her request for Prayer, Penance and Atonement. "Pope Paul VI gave utterance to a disturbing lament when he said, "There are forces within the Church, and priests and religious are numerous among them, who are doing far more damage to it than its bitterest enemies outside. "Many priests and religious are giving the Church the Judas kiss. "Satan himself has made his way into the temple of God!" The Holy Father went on to express a profound distress regarding what he called the "Church's auto-destruction." "Even from a purely biological point of view, the mother is the cradle of life. She receives the living being and brings it to light; she protects and nurtures this life; she fears, cares and suffers for it. When a child is ill, who worries more about the child than its loving mother? "Today the whole world, the Church [especially, priests and religious], is sick to the heart. For this reason our Lord, in His infinite mercy, sends His Mother, who calls us to prayer, penance and atonement, for these are the most effective medicines. His Mother to help and save. The honouring of Mary must then again be given a primary position. Mary was, and is, the great treader underfoot of the serpent and the victor in all God's battles. This honour is most seriously demanded. "You bishops, priests and members of religious orders, start, not purely in private, but together and with all publicity, to honor Mary afresh, and on a great scale! Above all, do it in churches, seminaries and religious houses. Begin now! The people, including the young, will follow you. Don't be put off by the scoffers! Lead the people to the shrines of Our Lady. See to it that they do not come merely to her, but through her, above all, to the Lord Himself---in Confession and Holy Communion. "The messages and requests of Our Lady are most appropriate to the deepest wounds and the greatest need of the Church of our time. 2. that anyone is free to believe in the Marian phenomena occurring at Montichiari. But, in any case, every believing Catholic should, in the present serious state of the Church, turn to Our Lady, and seek for himself, for his relatives and for all people, help and salvation. Anyone who has doubts about Montichiari can seek and find Our Lady's help anywhere, but he ought to seek this help. La Salette, Lourdes and Fatima have received ecclesiastical recognition. There, and in Montichiari, Our Lady asked most urgently that people should say the Rosary. "Do penance. Pray for poor sinners. So many are going to Hell for want of people to pray and make sacrifices for them." As Father Weigl says, "one can find the DSivine help anywhere, but it is specially accessible at the many shrines of Our Lady which the Church has approved, and at which many bodily and spiritual ailments have been cured. But has not Montichiari something special to say? and especially for 1975, the Holy Year? "If there is some charisma behind this, it should be a resounding call to all Catholics and to the whole Church. If Our Lady really appeared at Montichiari, we should take these messages seriously. "What are Mary's special requests? 1. Every 13th day of the month should be kept as a special Marian day. On the 12 preceding days special prayers should be said. 2. The 13th of July should be celebrated in honor of the "Rosa Mystica". 3. Annually at midday (12-1 p.m.) on the 8th of December the Hour of Pardon for the world should be observed. "If anyone cannot visit the church, he should pray at home at midday, He will then receive the same grace through me." 4. On the 13th of October of each year the World-day of Penitential Communion should be observed. 5. Penitential procession to the spring [Fontanelle]: This should be accompanied by prayer, penance and atonement. "What are Our Lady's promises? 1. More young people will be attracted and there will be an increased striving after holiness among priests and religious. There will be fewer losses and betrayals of vocation. 2. Holy vocations and superabundant graces for the members of religious orders. Return to the original spirit of their holy founders. 3. Innumerable conversions of great and hardened sinners, especially of priests and religious who have fallen away. 4. A sure guide to Heaven, maternal protection and an abundance of graces for all. 5 Special wonder-working curative power for body and soul in the spring at Fontanelle. "The sick should come to this spring, and with them many of my children." 6. "Fontanelle is to be turned into a light-house of faith, prayer and penance." 7. "Montichiari will be a hill from which the mystical light will shed its beams over the whole world. This will indeed happen." 8. "But the most evident miracle will be the return of the children to the true faith; to the true love of Our Lord. Following this will come the re-unification, the peace of the whole world." "Oh beautiful, dear Saint Mary, I thank you! Please bless my homeland Italy, bless the whole world, especially the Holy Father, the priests, the monks and nuns, and the sinners." Our Lady answered, "I have an abundance of graces ready for all those children who hear my voice and take my wishes to heart." THE IMAGES ON THIS PAGE ARE COPYRIGHTED. THE BACKGROUND IS A PHOTOGAPH OF A LOCAL PUBLIC GARDEN IN EARLY SPRING.